Smith, 50, a US citizen, served as managing director of Weir Minerals from 2001 to 2012. Before joining Weir he spent almost 20 years in the automotive industry working for Van Dresser Corp, General Motors and Britax Vision Systems. Smith holds a BSc in Business Administration and an MBA in International Business. 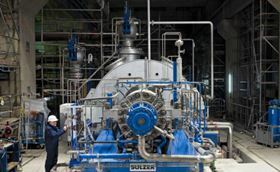 Kim Jackson, Sulzer Pumps’ president and a member of the Sulzer executive committee since 2007, will leave the company in mid-April to pursue other opportunities. The Sulzer board and executive committee thanked Jackson for his part in growing Sulzer Pumps organically, for his contributions to the division’s acquisitions and for broadening the global presence of the business.